In honor of the US holiday of July 4th, here’s a fun little slice of American History that isn’t usually found in the text books. The white house was host to quite a few mediums over the years and held many a seance, thanks to the greatest of our presidents and his wife, Abraham and Mary Todd Lincoln. During the civil war in America, spirituality was experiencing its golden years. Every Victorian parlour was host to mediums famous and infamous who promised to contact the spirits of the dearly departed. Understandably, the war left many grieving widows and mothers on both sides who wanted more evidence of life after death than could be granted by the church and society ladies competed to be able to host seances with the best mediums in the growing movement of spiritualism. Among those enraptured by Spiritualism, then boasting around 2 million members in the united states by the 1860’s, was the First Lady, Mary Todd Lincoln and the President himself, Abraham Lincoln. It is said that Lincoln was raised in a spiritual atmosphere, where rural families routinely sought out the wise women in the villages for a natural cure or prophetic advice. Although sources suggest that Mary Todd Lincoln was the true devotee of mediums, seances and spirituality in general, Lincoln himself was not averse to hosting the best of mediums of the day at the white house, holding various seances in the white house. In the years prior to the assassination of Abraham Lincoln, Nettie and other mediums tried to warn the president of his imminent demise. Whether he was simply tired of hearing the proclamation of his doom or rather didn’t know exactly how to prevent it, Lincoln simply carried on with his life until that fateful night when he was shot by John Wilkes Booth at Ford’s Theatre. 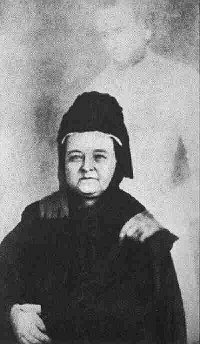 Mary Todd Lincoln did resume spirituality after the assassination, visiting several mediums under an assumed name. Although there isn’t much information on her experiences, it is said that on one occasion she witnessed Abraham materialize, and a spirit photographer by the name of William Mumler supposedly photographed her sitting with her deceased husband standing behind her [photo left]. Although the new photographers of the time quickly learned how to superimpose images in order to charge unwitting customers for “spirit photography”, Mary Todd Lincoln was said to be greatly comforted by the photograph, believing it was proof that Abraham was ever at her side. Despite her unshakable belief in spiritualism, Mary’s remaining years were sad and filled with emotional turmoil. Only one child survived her, and after the death of her husband, her emotional instability became worse. There were attempts by her remaining son to have her committed, but after a suicide attempt and the fear of a media circus, he relented and allowed his mother to live out her life with her sister, Elizabeth. At 63, she had a stroke and later died. Although most abandoned her after her husband’s death, it was said that her spiritual friends remained faithful to the grieving woman until the end.